View Poll Results: Did you know about the Problem Recording Tool before reading this? The only method I could think of was to download some screen monitoring software so that I knew what I was doing at a particular time (since the snap would include the computer time and date from taskbar). I tried to search for a free one but TightIT was not very reliable. It was not really capturing screenshots as I wanted. I needed something better. HappyAndyK gave me a link to use AutoHotkey in combination with DropBox to keep track of working. I am using that currently. But in the quest, I found something that I never knew existed in Windows 7. Probably you too do not know of Problem Step Recorder or psr.exe. 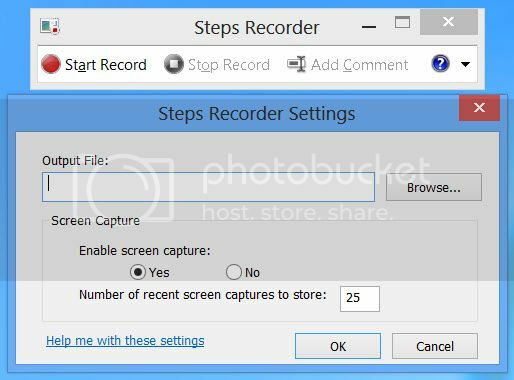 It is basically a troubleshooting tool that captures screenshots are regular intervals and stores the files in a ZIP file. Logically, it should appear under the Troubleshoot option in Control Panel but is not visible directly. If you click on "view all", it appears as Windows 7 downloads it from the Internet. It is not the case though - psr.exe (Problem Step recorder) is available in System32 folder in Windows folder on C drive. Can anyone tell me why such an important tool has to be hidden deep inside with no visible documentation? Dear Microsoft? What are you up to? PS: If you cannot find PSR, type PSR in the Run command window. Yes - the Problem Steps Recorder is a very useful tool in Windows 7 and Windows 8. I noticed a small change in its UI. The counter seems to have been dropped in PSR in Windows 8. I always use acethinker screen grabber online to record my screen, It's a free web-based application. Compare with Problem Steps Recorder, which one is better?